Every year or two I make the pilgrimage to St. John’s Island, South Carolina. 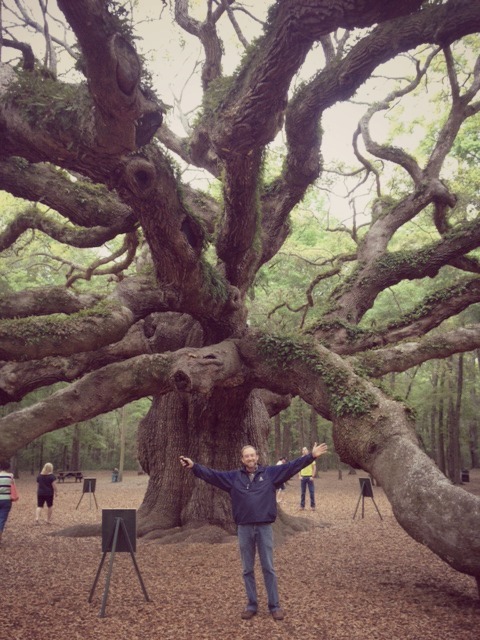 I make this journey for several reasons, not the least of which is to visit the ANGEL OAK. St Johns Island is hard enough to find, located south of Charleston in the “low country” (meaning swampy wetlands) along the Atlantic coast. But the Angel Tree is even more difficult to locate. It grows on a strip of land barely marked with a small sign along Behicket road on the way to St John’s. Why do I go back frequently? It’s because, besides being the oldest living thing in the Eastern United States – nearly 1500 years old, and standing 60 feet high, with a twenty-five-foot circumference, and a limb spread of 160 feet. — it is an unmistakable power point. The tree has a defined energy about it that one can feel, meaning that it has a level of beauty that opens us up inside if we have the patience to sit nearby for a while. Experiencing a tree, this old, is about as easy as it gets. The energy, as with all natural formations and life forms, lifts us into Divine Presence just by being in their proximity. Sometimes we open up all the way to the full connection where we get the complete download of love, centeredness, intuitive knowing, Syn flow, and life mission. At the very least we can get past whatever level of stuckness we find ourselves. What do you say to the naysayers? As near as I can understand, (it’s been so long since I was that brain dead) the thought process among atheists is: “Since there just can’t be a grey haired God in the sky that created all this, what we observe with our ego driven eyes must be all there is, right? There can’t be anything but delusion involved with trying to feel a tree?